Brian May has unveiled a special new edition of Monopoly based around Queen. The guitar legend took to Instagram and Twitter to share images of the set – which is set to hit shops in May. 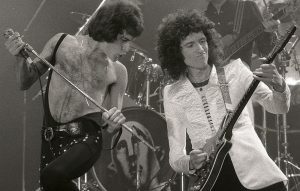 The board is emblazoned with a classic live photo of the rock icons, while the plot of the game has changed from amassing property to following the successful career of the band – from their very first gig at Imperial College in 1970 to their last show with Freddie Mercury at Knebworth in 1986. Meanwhile, the Monopoly game pieces have been changed to symbols to represent the band’s back catalogue – including a radio from ‘Radio Ga Ga’, a cyclist for ‘Bicycle Race’, a robot for ‘News Of The World’, a hammer for ‘Hammer To Fall’, a vacuum cleaner for ‘I Want To Break Free’ and Brian May’s signature guitar. Queen are also gearing up to head out on tour with Adam Lambert. The post Brian May unveils special new Queen Monopoly set appeared first on NME.